Upon the introduction of the Newburyport Preservation Trust Quarterly News in 2013, the plan was to eventually maintain an accessible newsletter archive. After publishing enough issues to merit such an identity, this page is the realization of that plan. Happy reading. Go ahead, collect 'em all! You'll be even more informed about NPT's relentless efforts to preserve the city's varied architectural assets and corresponding singular ambiance. Please feel free to share the links and/or the PDF files with interested friends and neighbors --- and then encourage them to join us via our Membership page. For up-to-date information on the most immediate preservation issues (like when members need to stand in front of bulldozers or storm City Hall), stay up-to-date by visiting the Newburyport Preservation Trust at Facebook: www.facebook.com/newburyportpreservationtrust. NPT Quarterly News, Fall 2013. In this issue: Restoration of 1822 Powder House receives national award from American Association for State & Local History; annual meeting preview; Historic American Building Survey (HABS) to begin at Powder House; and Words Not Necessary: R.I.P. to the 1823 James Carey House at 5 Strong Street. NPT Quarterly News, Winter 2014. In this issue: Deteriorating downtown brickwork needs attention; Preservation Week preview; review of "From Animal House to Our House" program by visiting author Ron Tanner; and Words Not Necessary: Bromfield Street house built 1810 --- gutted 2013. NPT Quarterly News, Spring 2014. In this issue: Preservation zoning laws passed by Newburyport City Council; Preservation Week preview; Powder House HABS report on the way to the Library of Congress; NPT's new historic house plaque program; and Words Not Necessary: c. 1750 Ship Street house "going, going, almost gone" on the way to demolition. NPT Quarterly News, Summer 2014. 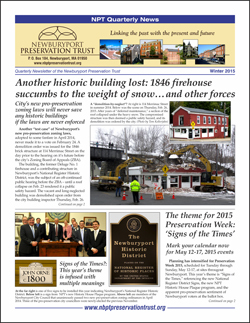 In this issue: NPT files formal appeal of the city's failure to prevent demolition at 59-61 Bromfield Street; preview of Zoning Board hearing to demolish 1846 former firehouse building at 114-118 Merrimac Street; Zoning Board hears first appeal under the new preservation zoning laws --- and allows demolition of 1875 house on Collins Street; and Words Not Necessary: 24 Collins Street approved for demolition. NPT Quarterly News, Fall 2014. In this issue: Powder House progress report: public events, school visits, HABS survey, & landscaping; NPT loses appeal on 59-61 Bromfield Street demolition; annual meeting notice; and continuing coverage of the Zoning Board hearing to demolish 114-118 Merrimac Street to build a two-family home. NPT Quarterly News, Winter 2015. In this issue: Demolition by Neglect: 114-118 Merrimac Street succumbs to the weight of snow ... and other forces; Preservation Week preview: "Signs of the Times"; NPT probes feasibility of more visible presence in a downtown office. NPT Quarterly News, Spring 2015. In this issue: Preservation Week recap: "Signs of the Times"; Preservation Award winners; P-Week house tours spotlight NPT's Historic House Plaque Program; incongruous addition at 77 Lime Street prompts the City Council to close loopholes in the city's zoning ordinance; and "It's Game Time": Find the missing c. 1800 chimneys in a "new-and-improved" alteration. NPT Quarterly News, Summer/Fall 2015. In this issue: City Council zoning amendment redefines two-family and multi-family additions to address infill projects; NPT hits the streets at Yankee Homecoming; Powder House update; Historic House Plaque Program update; Condemned 1824 "house of squalor" on the fast track to demolition; and Words Not Necessary: Photo of a fake chimney built to blend into "olde quainte Newburyport." NPT Quarterly News, Winter 2016. In this issue: NPT's preservation advocacy sparks cautious enthusiasm; preservation education takes center stage with NPT's "Do It Ye Self" sessions; big-time exposure for Newburyport home that sports an NPT historic house plaque; 1824 "house of squalor" demolished, as health department order takes precedence over new pro-preservation zoning laws; and a Preservation Week preview. NPT Quarterly News, Spring 2016. In this issue: Preservation Week preview: "Preserving the Architecture of Faith"; NPT consultation with developer results in preservation of the 1790 Capt. James Clarkson House at 48 Boardman Street; update on the "Frankenstein House" addition a7 77 Lime Street; review of NPT "Do It Ye Self" program with lime mortar expert Fabio Bardini; and an editorial: City approval of 114-118 Merrimac Street project would reward speculation and encourage demolition-by-neglect. NPT Quarterly News, Summer 2016. In this issue: Preservation Week recap; Preservation Award winners; preview of "If This House Could Talk" Yankee Homecoming program; preservation advocacy update, including the"Frankenstein House" mitigation fee, the denial of variances for 114-118 Merrimac Street, and the developer's withdrawal of his application to demolish a small 1875 house on Howard Street; and a notice of publication for Bending the Future: 50 Ideas for the Next 50 Years of Historic Preservation in the United States. NPT Quarterly News, Fall 2016. In this issue: An article on a former Newburyporter's blog post lamenting the ravaging of historic homes that received national attention; NPT gift memberships; an update on NPT's Historic House Plaque Program; announcement of NPT's "Serving Up Storied Homes" fund-raising event; and a "Words Not Necessary" look at an "exploratory demolition of a 1752 Georgian home that filled a half-dozen Dumpsters..
NPT Quarterly News, Winter 2017. In this issue: NPT's response to the city's draft Master Plan "infill map" and other preservation topics; Preservation Week 2017 dates; invitation to the NPT Annual Meeting; announcement of NPT's Do It Ye Self event, "Cooking in Beehive Ovens"; a call for 2017 Preservation Award nominations; and NPT's nomination as a "Trailblazer" by the Essex National Heritage Area. NPT Quarterly News, Spring 2017. In this issue: Preservation Week preview: "Newburyport in the Historic American Buildings Survey;" NPT fund-raising event, "An Evening in Gaol;" announcement of the new book, The HABS and the HABs NOTS: Documenting the Architecture of Newburyport in the Historic American Buildings Survey by R.W. Bacon; and an update on the "1690 House" fiasco at 262-264 Merrimac Street. NPT Quarterly News, Summer 2017. In this issue: Preservation Week recap; Preservation Award winners; NPT input on Newburyport's draft Master Plan; "If This House Could Talk" program expands to the North End; and "Oops! House history is more than deed records." NPT Quarterly News, Fall 2017. In this issue: City Council approves zoning changes to preserve integrity of historic neighborhoods; preservation restrictions placed on the "1690 House;" Zoning enforcement officer moves to full-time status; Book award for The HABS and the HABs NOTS; NPT board member R.W. Bacon invited to speak at the 2017 Architecture Boston Exposition; and a new NPT Historic House Plaque at 323 Merrimac Street. NPT Quarterly News, Winter 2018. In this issue: Preservation awareness advances in 2017; program announcement for "1970s Revisited: Would You Buy This House? "; NPT Annual Meeting announcement; 2018 Preservation Week theme: Newburyport Parks: Past, Present, & Future"; and a program announcement for "Documenting Historic Structures: How the Pros Did It in the Historic American Buildings Survey." NPT Quarterly News, Spring 2018. In this issue: Preservation Week preview of presentations & programs featuring Newburyport parks; update on collapsed building on Merrimac Street; house research workshop at the Newburyport Public Library; preview of the 2018 "If This House Could Talk" program; and a recap of NPT's winter preservation education programs. NPT Quarterly News, Summer 2018. In this issue: NPT 2018 Preservation Awards; 2018 Preservation Week recap; preview of the "If This House Could Talk" program; Plans for High Street alterations proceed without a Section 106 review; "It's business-as-usual at City Hall as lapses in procedure continue. ;" and Words not necessary: Preservationists cry 'foul' at Fowle's." NPT Quarterly News, Fall 2018. In this issue: Update on "Safe Routes to Schools" project on High Street; Member opinion: "Do we 'preservationists' have an image problem? Might we get better at articulating preservation? ;" NPT's new Instagram page; and a new NPT Historic House Plaque at 6 Beck Street.